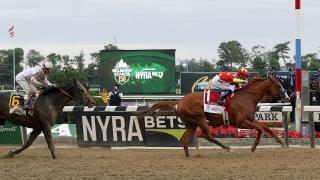 (Newser) – Justify led all the way to win the Belmont Stakes by 1¾ lengths and become horse racing's 13th Triple Crown champion and second in four years. The chestnut colt is the second undefeated colt to sweep the Kentucky Derby, Preakness, and Belmont, improving to 6-0 in a racing career that began on Feb. 18, per the AP. Seattle Slew was unbeaten when he won the Triple Crown in 1977. Seems like yesterday Smarty Jones was coming up a little short. Belmont is a beast! Glad we have another successful run as they were quite rare for a long time. My buddy's wife bets on the ponies. She made him a millionaire, but before that he was billionaire. Animal abuse. Justify horse won, it has nothing to do with the small size rider.